This is an unusual blog for me. During the past fourteen years, I’ve truly done my best to be a diplomat, but today, I’ve laced up my boxing gloves. Each year, nearly 40,000 Americans die from asbestos-caused diseases, yet raw asbestos imports and use continue. Enough is enough. July was a big month for environmental and public health nonprofits throughout the nation, as the embattled EPA Administrator Scott Pruitt finally resigned on July 5. Don’t get too excited though, the new Acting EPA Administrator, Andrew Wheeler, is a former powerhouse coal lobbyist. It wasn’t long ago that everyone, including the chemical industry, used asbestos as the poster child for the need to reform the Toxic Substances Control Act (TSCA) of 1976. It was abundantly clear to all lawmakers and stakeholders, that any TSCA reform legislation must enable and ensure the EPA could finally ban asbestos, or this reform would fail Americans again. 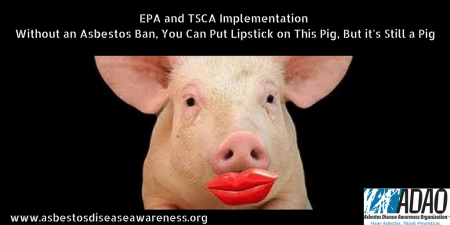 Rest assured, ADAO stands with allies and colleagues in fighting to force EPA to implement TSCA according to the law. However, we face enormous obstacles with the Trump EPA at the helm. EPA’s failure to protect public health is appalling, as seen in their grossly inadequate approach to evaluating the risks of asbestos. The EPA is relentlessly ignoring the risks of asbestos in our homes, schools, workplaces, and communities, referred to as ‘legacy’ and also the Libby Amphibole, as demonstrated in the EPA Problem Formulation of the Risk Evaluation for Asbestos document. EPA will not evaluate all of the cancers linked to asbestos except lung cancer and will not consider serious non-cancer health effects. ADAO has been a stakeholder in the fight to ban asbestos for 14 years. We are honored to have written legislation, been a congressional witness, and even watched President Obama sign TSCA Reform into law. Our fight is your fight. Join over 13,000 people and sign our petition pressuring the EPA to ban asbestos without any loopholes and to address the growing health threat from the pervasive presence of asbestos in buildings across the US! ADAO will submit all petition signatures to the EPA on August 8 to voice our extreme opposition to the exclusion and SNUR. This entry was posted in Blog and tagged ADAO, asbestos ban, chlor-alkali, EPA, EPA Problem Formulation, Linda Reinstein, Scott Pruitt, Significant New Use Rule, SNUR, Toxic Substances Control Act, TSCA. Bookmark the permalink.